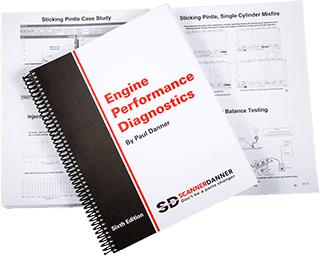 Whether you are a shop pro with years of experience or a DIY-er, "Engine Performance Diagnostics" will keep you from falling into that "parts-changer" mentality and will enable you to make a confident diagnosis, save money and increase your income-earning potential. This book was originally written for my Engine Performance class at Rosedale Technical College and is now being used in classrooms, shops and backyards world-wide. Both the ebook and printed book will serve as your guide to electrical and electronic systems trouble shooting. Let me help you fix that check-engine light! Code and the link to access your new eBook. **Check spam for mail from bookguardpro.com. YOUR eBOOK PURCHASE IS 100% GUARANTEED! If you are not satisfied with your purchase, you may receive a full refund within 7 days of the purchase date! As a eBook owner, you qualify for a $20 discount on the paper book. Click here to request the paper book discount. The printed version is distributed by AESwave. It has the same content as the eBook and makes it easy for you to take notes while watching videos or to use as a quick field reference. Buy it today for only $99.00! As a paper book owner, you qualify for a $20 discount on the eBook. Click here to request the eBook discount. I hate engineer-written flow charts! "These are step-by-step procedures that some engineer thinks is the best way to troubleshoot. They are never written with speed in mind. How could they be when half of them start off with disconnecting the computer and the sensor and checking the wire for opens and shorts? Do they realize that step one could take more than a half hour to just get to the computer? This is ridiculous!" "Well, I have found a better way and I want to share it with you. I developed these techniques over the past 20-years performing and teaching driveability diagnostics and computer systems troubleshooting; first, as a mobile tech in the South Hills area of Pittsburgh and now as an instructor at Rosedale Technical College near Pittsburgh, PA."
Some of my methods are a little unorthodox..
"Some of my methods are a little unorthodox, but if used correctly there is no faster or more accurate method for troubleshooting computer systems than what I have outlined in this book. My approach gives you the foundation of testing methods and precepts that can be widely applied, not only to engine management systems, but also, all of a vehicle's computer controlled systems. This includes, but is not limited to, transmission controls, body controls, anti-lock brake systems, and climate controls." "Of course, but only as a guide and almost never literally. Maybe someday engineers will wake up and figure out that some of us can handle more information than what they are providing. Until then, you must develop a more complete understanding of sensors and circuit designs. My book will help you do that." "Once you understand these fundamentals explained in my book you will be able to troubleshoot ANY computer controlled system, not just a fuel injection computer. I even fixed my furnace at home using these same principles!" If you have already purchased Paul's eBook, click here to access it. (You will need your License Code to proceed).